I have decided to create a diary of my little project for others to see etc. I have posted other threads here on this subject but will try to keep this one current. I am 6 or so years away from retirement and have been looking for a small lathe to piddle on when I do retire. I came across this machine on Facebook Market place. I made the deal and brought it home (actually to my workplace for now). The machine doesn't have any drive components other than the gearbox with one gear missing. The machine is missing the lower headstock cover and the upper cover has a chunk missing. It is missing the end and rear covers as well. I have already begun repairing the upper cover and it is coming along nicely. I'm using fiberglass and resin along with a piece of angle iron to later drill for the pin. Also, here is a pic of the bars and covers I have cleaned and primed. I have found a gear via Boston gear and Grainger that will work with some modifications. See pictures. I made a temporary alignment plug to make sure the gear will mesh good and it does. 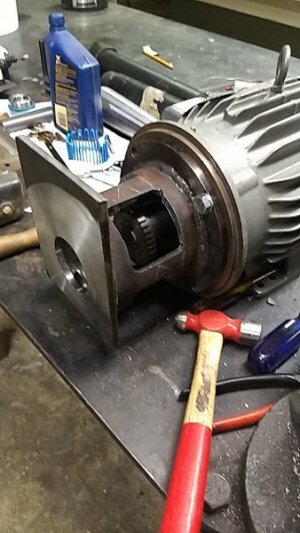 I drilled, bored the gear to .876" diameter and then broached it 3/16". I took a piece of keystock and milled it down to fit both the gear and shaft. Next I will work on the shifting fork that is broken and make the little brass followers and of coarse the spool they ride in. I want to paint it up similar to this one....with crimson and white colors! No. It does not have a tailstock. I probably will have to adapt one to fit. I will probably use the turret more. That sliding gear is actually two gears; the small one you are making that meshes with the larger spur gear for back gear operation and a larger gear that meshes with the hollow circular gear for high speed operation (1:1 ratio). Do you have that one or will you make/buy it? Yes, I have the one that makes up for 1:1 ration. I needed the other small one. I found it thru Grainger and bored/broached it. update: I put a down payment on a motor today. It is a Baldor 5 hp 3ph with a 1-1/8" shaft. it also has a seperate cooling fan that is powered by 120v. Now for the VFD!....I'm thinking I need to have the following capabilities...1. start forward 2. start reverse 3. Stop 4. jog 5. adjustable RPM 6. momentary reverse(for tapping). Thoughts on VFD brand??? My 10EE has an up center down rotating shaft with handle for forward stop reverse. I wired the forward to the VFD forward and the reverse to the VFD reverse. Then you got the original control. Alost replaced that HUGE rheostat on the speed knob with a itsy bitsy one for the VFD. Again, now you got the orginal control to run your machine. I think a brake resistor is mandatory on this lathe, makes it stop quickly. I also wired an E-stop to the machine. I habitually E-stop the drive when ever working on the chuck, changing parts etc. just makes things safe. Anyway with this setup the vfd is just programed for run forward, run reverse. Tons of great places to buy a VFD, they all seem good. I prefer Automation Direct and their GS2 drives. They have made a loyal customer out of me because of excellent customer service and they stand behind their products. Thank you for help. will check it out! Update on my project. 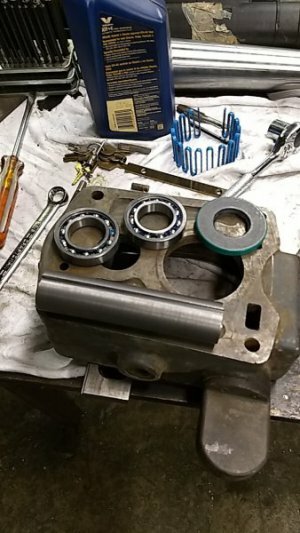 Purchased 2 bearings and a seal. welded up the 2 plates and pipe for the housing. Used the laser to make a window template to cut out windows in the pipe. It is basically ready for the gearbox, however I need to make a piece for the shift fork to ride in on the small gear. The 10EE is a great looking lathe. I'm in Birmingham and would love an update on your 10EE restore. Also, A Row Tai Row!! Love the Monarch - and very impressive work so far. I will be following along as you go.